The news of the day: Think about the end goal . . . whether it be your decision to come to class or your everyday activities. Everything is a choice. Sometimes the effort doesn’t fit your mood. 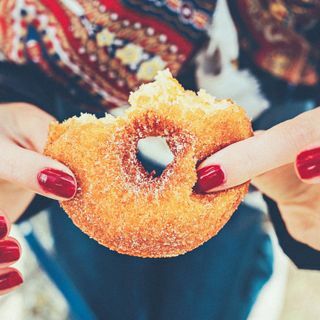 You really want a donut, but you know your goal is to lose 10 pounds. You want to go out to dinner, but you know you are trying to save money to buy a house. Everything we do is a choice. There is always a last bite, ... See More whether it’s your first or the tenth. At what point do you start or stop. Sometimes we agonize to make the decision, other times it is a very easy decision, still other times there is no agony as you didn’t even think about it. Try to find satisfaction in the sacrifice of whatever you are not doing . . . valuing your decision and how much closer you are to realizing your real goal. We are a society in search of instant gratification, and we don’t generally like to wait for it. Take the time to evaluate your goals or intentions. Are they clear? Are you motivated to attain them? Should you re-evaluate them in lieu of some verbiage that might be more meaningful for you? Do you think about them throughout your day or are they just some words you wrote down because you thought it was expected of you? Until you make your end goal compatible with your heart, your mind and the effort you are willing to put forth, you will remain frustrated in the accomplishment of that goal. Give it some thought and don’t allow other people’s opinions or thoughts overshadow your real wishes. As always feel free to share your questions or comments by posting to our Facebook Group Page at RiversZen Online Community or email us at info@riverszen.com or call or text at 503-440-3554.